I’m a man who likes to speak the truth. I think the truth is necessary in order see or achieve greatness. Truth gives us clarity. Jesus said, “the truth will make you free.” I like the word ‘make’ in the that quote. Its so accurate. He doesn’t use the phrase ‘set you free’, but says ‘make you free’. Truth forces our perspective out of its comfortable cage of lies and throws us into reality. For example, if you’re reading this, you will die. No if’s and’s or but’s. We die, period. What’s a more life changing event than you’re own death? I’d say nothing. That truth may seem scary or dark or sad, but its none of those things, its just true. In American society in particular, we don’t value truth at all. We live in the information age, and sooooo much truth and knowledge is available to us now that was never available before. 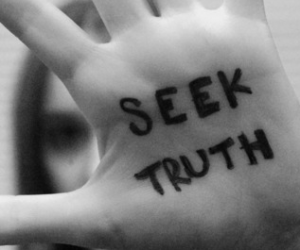 Rather than seek truth/pure knowledge, we seek out lies. We over expose ourselves with lies via; music, movies, books, social networking, news media, videogames, etc. Anything you expose yourself to for too long becomes a part of your world & life and is beheld as true to yourself in some degree. Whatever you’re exposed to has an effect, and longer you’re exposed, the more lasting and deeper the effect. For example, if you expose yourself to the sun for too long, it will hurt you; expose your ears to sound for too long, you’ll have hearing loss. We tend to think that because we use all these lies for fun or for entertainment, that they don’t effect us. To that I ask, does it matter whether you’re in the sun for 6 hours having fun, or 6 hours having a terrible work day? Will the sun choose not to burn you because you were having a good time? Its evident that these lies have infiltrated and become part of our lives and we readily expect others NOT to tell us the truth. Observe little things throughout your day. If someone asks, “How are you?” try giving them the whole truth. I’m sure the look you’ll get in return will not be nice. If someone you know has a new hairstyle that you honestly don’t like, and they ask you, “do you like my new hair”, try telling them the truth. The whole and simple answer to that question would be, “no.” Try NOT telling your children lies about Santa Claus, the Easter bunny, the Toothfairy, etc. I’m sure the parents that do tell those lies to their children will be very upset with you when you’re child interacts with their child. Lies should not be a form of courtesy, and at the same time, I’m not advocating a harsh truth. I just believe that the world would be better and we would be stronger if we exposed ourselves to the truth more often. Blue, I honestly agree with your standpoint on truth and lies. Your morality is something I look up to and use as a model for my own life. While I may not be as truthful as I would like, I feel like I’m getting closer and closer everyday. I have a question to ask you when I see you next that I need you to answer honestly. I would text or email it to you but I want to talk about it in person. Thanks for the inspiration!